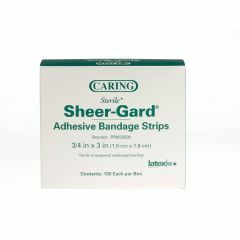 Caring Adhesive Bandages with sheer plastic backing. Long-lasting adhesive with minimal residue. Sterile and absorbent non-adherent pad. AllegroMedical.com presents The Caring Plastic Adhesive Bandages. Caring Adhesive Bandages with sheer plastic backing. Long-lasting adhesive with minimal residue. Sterile and absorbent non-adherent pad.